This morning wasn’t good. Around 4:45AM I was awakened by Samantha howling in pain. She had gotten sick and was barely walking. After a quick clean up, she had a few accidents. She had her first seizure close to 6AM. John and I were up with her at this point and she was in a lot of pain. She had another seizure, perhaps a stroke, around 7:30AM as we were getting ready to take her to the vet. At 8:15 this morning, we decided that since she was in so much pain and at her age wouldn’t tolerate many treatments… she would be better off going to heaven. 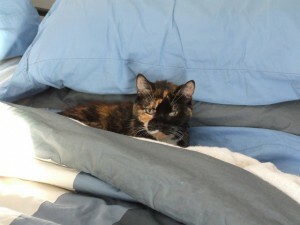 She would have been 20 years old this November. Sammie and I have been together since 1991. I clearly remember the night she came into my life. My brother John and his friend Shawn (who were living with me in Atlanta at the time) had promised to take me out to dinner for my birthday. I got home early from work and the guys weren’t there. I waited and waited. Finally ate dinner by myself at home. Close to 10PM they walk in. Shawn was carrying a big box of “stuff” and John was clutching his jacket close. I was just about to unleash a barrage on them about timeliness and commitment, when John leaned down to the floor and opened his jacket to let a teeny ball of fur loose on the floor. She took one look around and decided that she’d stay. Apparently, the guys had been looking all over the area for the “right kitten” and they found her! 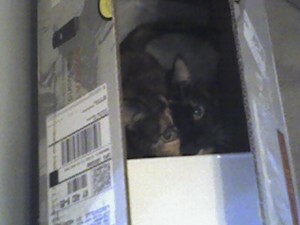 She was about six months old when I packed up and moved to San Mateo, California. She made the plane trip without any issues. My grandmother Elsie came out to help us get settled in – she and Samantha became ice cream buddies! Even last night, Sammie had to have her “3 licks” of the bowl when I finished my strawberry ice cream. Her favorite was mint chocolate chip! 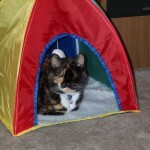 My Mom bought her a “tent” right before I moved to Louisville, Kentucky. That was her hideaway for many years. This past year, she’s camped out in a stack of laundry baskets and claimed a blanket that Lisa made for me as her own. 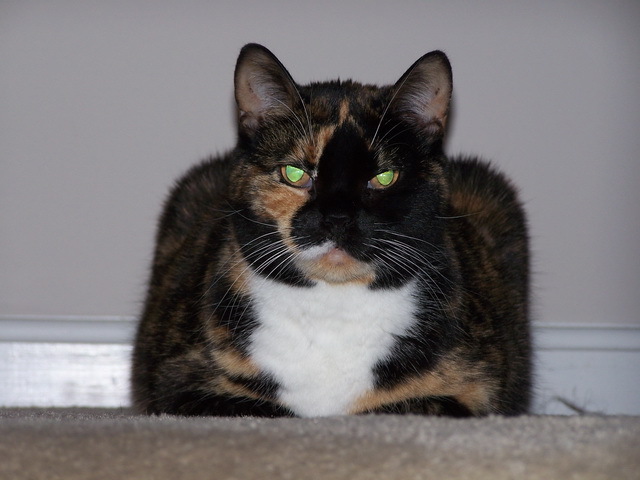 When she was younger, she would play with wadded up balls of aluminum foil, tiny furry mice that my Mom would by her. There are about 20 of those furry mice! They have hard cores inside… stepping on them barefoot is brutal! She would bat the crap out of them. I’d find them all over the place! I finally had to get her a toybox for all of her stuff. She was very possessive of her toys. Once when I was travelling, Lisa and her husband were taking care of Sammie. Lisa’s husband got into the toy box trying to find something to play with Sammie. Apparently she got really pissed. Dumped all the toys out and rescented them. We all learned not to do that again! Her favorite toy of all time was her catnip-stuffed Bill Clinton doll. 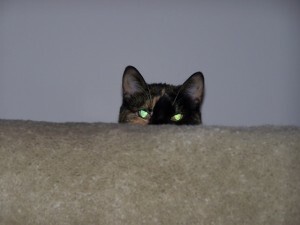 Just don’t ask… ok. She was also one of those cats who loved mint and menthol. Put on some icy hot and she’d be your best friend! 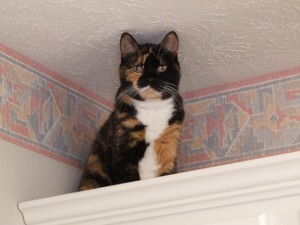 She also loved getting into boxes and up on top of cabinets. When John and I were dating, she tolerated him. He would bark at her whenever she came over. She did the typical cat thing and ignored him. When we got married and back from our honeymoon she had different thoughts. That first night in my old house, she was puzzled why he didn’t leave like before. She was even madder that he was there in the morning, so she let him know and left him a present in his sneakers. After he fed her a couple of times, she relented and allowed him to stay. We’ve been in our house since November of 2009. Sammie settled right in and loved walking around to all the sliding doors and watching the birds. As she aged, the playing stopped and she slept more. 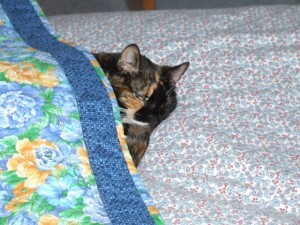 John really spoiled her by covering her up and tucking her in – lately in the mornings, the bed had to be made so she can start her nap! She really loved the quilt that our friend Judy made us for our wedding! In some aspects, I knew “her time” with me was drawing to an end. She had become more clingy and cuddly that she’d ever been. In the evenings, she would snuggle next to me as I worked on the laptop while John and I watched TV. Early mornings she would be sleeping next to me or between me and John. I’ll miss you Sammie Kitty! So sad, Jyll. But it sounds like a great full life! Thanks, Christy! 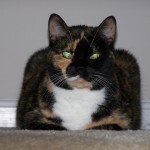 She was an amazing kitty! Thanks, Lisa! I remember you telling me the story about you and David checking in on her. The alarm went off and poor David… trying to hold and “comfort” a cat with very active (and sharp) back claws! Jyll, my heart aches for you. I, too, had to put a little buddy to sleep when she developed cancer. What a delight, though, to read the little stories you posted about her. And almost 20 years?! She must have loved you VERY much to hang around for so long. So sorry to hear about Sammie. Thanks for the great blog about her life with you. I particularly liked the part about the ‘treat’ in John’s shoes. So typical! My heart goes out to you guys.